The other day Steve bought about a kilo of organic carrots when I only needed a couple. So I was searching around for ways of using them up. I almost made Ivy‘s carrot cupcakes, but I didn’t have any oranges, so I decided to try something different. I ended up with this recipe from Smitten Kitchen, but as so often with American cake recipes I ended up changing it so radically it was hardly the same recipe by the time I’d finished. The result was quite different from Ivy’s cakes, but equally delicious. 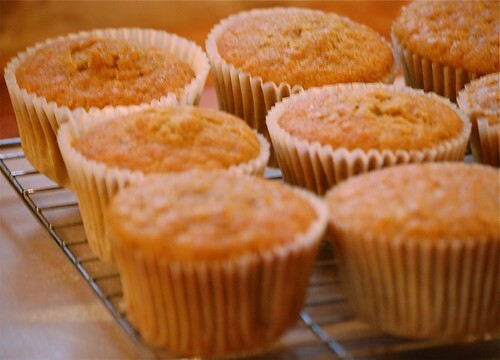 I loved the spices, especially the ginger (I’d even add a bit more next time), and the cakes were both light and moist. It was yet another cake recipe that specified 2 cups each of flour and sugar. Hey people, a cup of sugar weighs about twice as much as a cup of flour! I like my cakes to taste of something other than sugar, especially when they are topped with tooth-achingly sweet frosting. So I decided to go for pound-cake ratios — equal weights of sugar and flour — reducing the sugar content by half. The recipe uses vegetable oil instead of butter. I thought this was a bit odd, but we’ve been eating an awful lot of saturated fat recently, one way or another, so I decided it was time for a change. Again, 260 ml of oil looked like a lot, so I reduced it to 220, and I think I could even have used a little bit less without ill effect. If you want, you can replace all or part of the oil with softened butter. And finally, instead of the raisins and walnuts, I used some chopped candied orange peel. But I think they might have been even nicer with chopped candied ginger as well or instead (can you tell I really liked the ginger flavour?). This recipe makes a large batch; I used muffin tins and got 16 cakes out of it, but they would have been better a bit smaller. I frosted them with Ivy’s mascarpone frosting, except that I added maple syrup to it instead of lemon zest. Preheat oven to 170C. Line cupcake tins with paper cases or butter and flour them). You can grate the carrots in a food processor, but I used the microplane, yet again — it makes finer shreds. Stir all the dry ingredients, except the sugar, together in a bowl. In a larger bowl, whisk the sugar and oil together thoroughly. Then beat in the eggs one at a time. Add the flour mixture and stir till blended. Stir in carrots, and sultanas or other flavourings if using. Spoon into the prepared tins, filling them about 3/4 full. Bake for 15-20 minutes, tesring with a skewer to see if they are done. Cool in the tins for 15 minutes, then remove to a wire tray. Peel off paper and let them cool completely before frosting. For the frosting, just beat together all the ingredients and chill in the fridge for 10 minutes, then pipe or spread onto the cakes. Carrot cupcakes sound like a good idea. I find that a carrot cake slice can be too rich at times or even too filling. This way you can have the right amount without wasting any. Thank you so much for that recipe!! Carrot cake and cupcakes are my favorite and haven’t find a way until now to make them exactly as I like them. Your post helped! 🙂 I think I will do some to give to our guests when they come to visit us.Keep up with the good work!